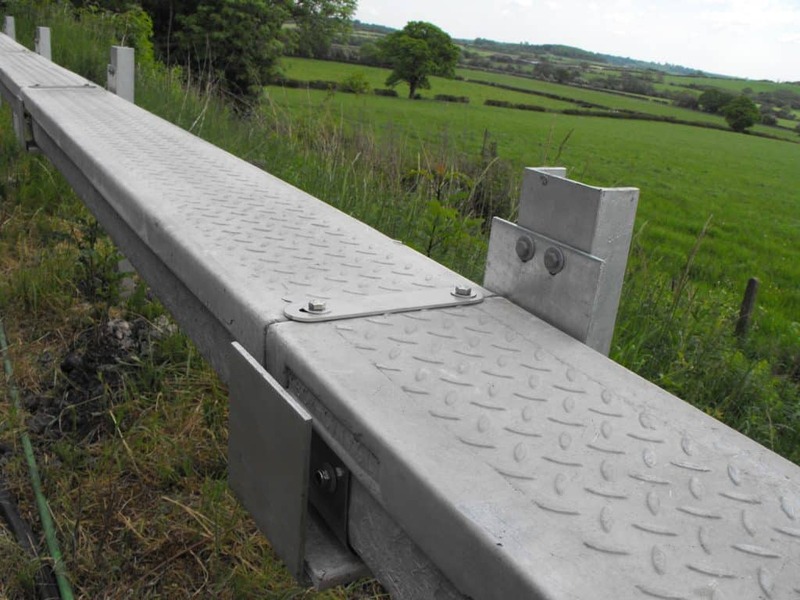 Cable trough provides both a high security shallow trench for cable protection and management with support for post elevated cable routes – we distribute a range of cable troughing systems manufactured in GRP, GRC or concrete for all infrastructure installations including railway, highway, power, telecoms and utility projects. T&D working with Anderton, BCM and Schneider distribute cable troughs from stock designed to protect underground and elevated cables including LV-HV power, signalling and telecoms up to 33kV. All rail cables are protected against accidental damage or vandalism whilst remaining easy to access if maintenance, jointing or future upgrade is required. Cable trough ensures the ground stability of trackside and lineside cables without experiencing gradual displacement, “snaking”, caused by ballast disruption from passing train movements. T&D range of protective troughs are supplied in a range of sizes (diameters and depths) and specifications to suit the installation and capacity needs of the client and application. For rail cables in tunnels T&D supply cable hangers to provide support for single and multiple runs of power and signalling cables, the J-type hangers are available in galvanised steel or a non-metallic nylon material conformant with London Underground 1-085 specification. Trough and protective lids with Network Rail PADS approvals ensure protection of trackside power and S&T cables on the UK rail infrastructure – this includes LV copper and aluminium dc traction power and medium/high voltage (MV-HV) power cables supplying 11kV, 25kV and 33kV electricity distribution. Troughing systems for Network Rail NR/PS/SIG/00005 (formerly RT/E/PS/00005) signalling cables provides high strength protection to vital rail cables – the easy to install trough systems include channels, lids, stakes, brackets, bends and tee’s to enable the containment and installation of rail signalling cables. PADS (Parts and Drawing System) numbers relate to the Network Rail register of individual product references which comprise an approved product database for use on trackside, station, underground, tunnel and infrastructure applications on the UK rail system. The Network Rail PADS system preserves rail safety, product compatibility, reliability and prevents against risk elements damaging the operationality of the rail system through the installation of equipment not “fit for purpose”. ➡ View our complete range of GRP, GRC and concrete Cable Troughs.